Aquatic vascular plants include the ferns and flowering plants that grow submersed in water, float on the water surface, or have basal portions inundated with foliage and upper parts emersed. 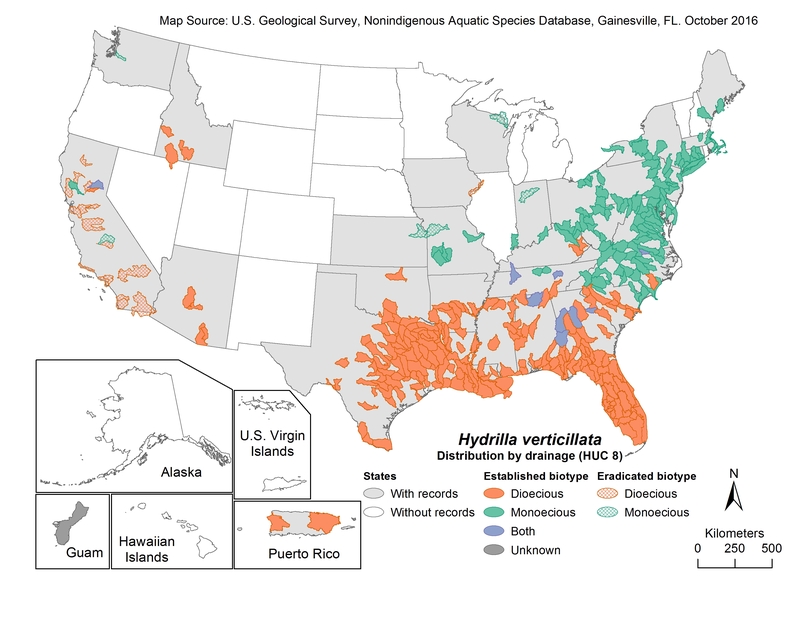 Diverse in form and habit, many aquatic species have become established in the United States outside of their natural range. Introduced intentionally or escaping from cultivation, nonindigenous plants can colonize aquatic communities. Hydrilla (Hydrilla verticillata), waterhyacinth (Eichhornia crassipes), and Eurasian watermilfoil (Myriophyllum spicatum) are examples well known for their ability to establish permanent populations. We welcome any contributions or comments you may have. More plant species are forthcoming as we update their distributions and profile pages.